Keyed is an AddOn that allows you to browse your guild's Mythic+ Keystones. Have guild members install the AddOn. 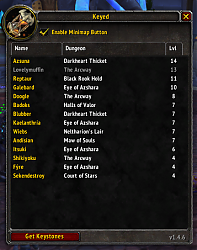 It isn't possible for Keyed to "talk" to guild members who do not have the AddOn installed, so for them to show and update on the list, having the AddOn installed is a requirement. /keyed - will show the Keyed User Interface. /keyed clear [db/database/player-guid] - will delete a player's database entry. This also works when a guild member is offline? Will it use the guild note to share with others what key you have or something? Or only works if someone is online at the same time? What happens if a key is used? Will it show up as used in the list if you have the addon installed? Last edited by Tonyleila : 11-06-16 at 09:23 PM.